Traditionally live on Channel 24 at 22.00 on 13 September. Having occupied the position of the prosecutor-general, Yuriy Lutsenko gave the old team of 100 days to demonstrate professionalism and results. And with it, to prove their effectiveness. It has been a long time since the Prosecutor General's Office have worked that fruitful, producing high-profile corruption cases one after another. In mid-August, Yuriy Lutsenko reported on the first three months on the new job. Tomorrow, 13 September, he will answer the questions of Sonya Koshkina at her talk show Left Bank on Channel 24. 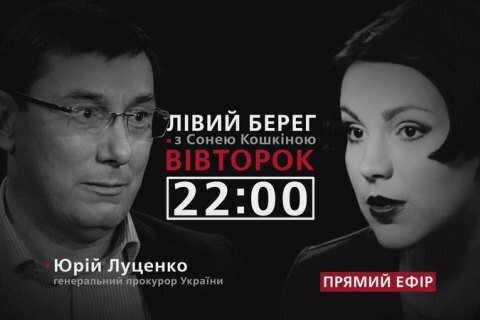 On highly-placed corruptioners, the reform of the prosecutor's office, the confrontation with NABU and many other things, on Tuesday, 13 September at 22:00, live on Channel 24. The text version of the interview will be published on LB.ua later.